Most people in Britain are now familiar with the scruffy, boyish and invariably unshaven features of Roman Abramovich, owner of Chelsea football club, and Russia's most famous billionaire. 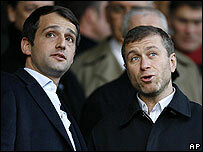 This week we learned that Mr Abramovich is one of a growing list of hyper-rich Russians. According to Forbes magazine Russia now has 60 billionaires. Unlike Mr Abramovich, most of them live in Moscow, which, if I'm not much mistaken, makes the Russian capital home to more billionaires than any other city in the world. How exactly these people have got hold of such vast wealth in such a short time is a very good question, and one many ordinary Russians would like answered. It is one reason why Russia's richest people like to keep their identities and their lifestyles secret. It came via a rather circuitous route. The sister of one of my colleagues in the BBC Moscow bureau is in the same class as the 18-year-old daughter of one of Russia's richest men. For some peculiar reason Svetlana, not her real name, thought it would be fun to invite a BBC television crew to film her parents' country cottage. That's what they call them in Russia: cottage. If that brings to mind white-washed walls, a thatched roof and climbing roses, then forget it. We had agreed to meet Svetlana at a shopping mall on the edge of Moscow. Up she swept in a purple Maserati sports car. Out jumped her hulking bodyguard, dashing round to open the door for her. I don't know what I was expecting to emerge, a leggy blonde dripping with diamonds and brimming with self confidence I suppose. Instead, out stepped a diminutive, dark-haired woman, painfully shy, and dressed like a secretary, albeit one who shops at Prada. Her crew-cut bodyguard looked me up and down, clearly horrified at the prospect of this grubby journalist scuffing the beautiful cream leather interior of Svetlana's Maserati. There was immediate relief when I suggested I follow in the BBC's beaten up old Peugeot. The first signs of the secret city were enormous green fences, at least 20 feet (6 metres) high, and topped off with closed circuit cameras. Then ahead of us at the end of a long forest flanked road a gap appeared in the fence. As the Maserati approached the gate swung opens and we swept through. Suddenly we plunged out of the forest, and in to a different world. It was a little like a scene from Doctor Who. One minute we were in Russia, the next in Beverly Hills. 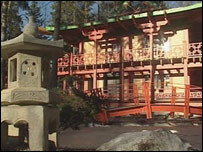 On either side of us huge mansions stood in spacious grounds. Some looked vaguely Georgian, others Victorian, one like a Bavarian castle. Vitaly, the BBC driver, turned to me, his face deadpan. "When did we cross the border?" he asked. 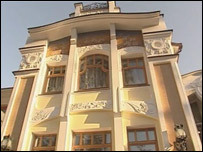 Svetlana's "cottage" was a spectacular 3,000 sq m Art Deco pile. How big is that? Big enough for an indoor swimming pool, a cinema, a bowling alley, a ballroom, and the piece de resistance, its own indoor ice rink! "This is our newest house," Svetlana told me as we walked past a large bronze sphinx in the gardens. "My father's been building it for five years." She wasn't sure how much it had cost, "probably 20 million," she guessed. "So how many other houses do you have?" I asked. "A couple in Moscow, two in the south of France, and one in Corsica," she said, as if it was the most natural thing in the world. She shops in Paris and Milan, where she flies on one of her father's private jets. All these toys have not made Svetlana a happy girl. "I live in a gilded cage," she told me. "I have no friends and no freedom." I did feel sorry for her, but only a little. A mile down the road, firmly back in Russia, I went to see Mrs Rima. The 75-year-old showed me around the one-room shack she built with her own hands. She survives on a pension of £60 a month. I asked her what she thinks of the rich people who live behind the high green walls. "They're all thieves," she said. "All that money is stolen from the people." It's a view millions of Russians would agree with. Fifteen years ago everything in Russia was owned by the state. Today a quarter of Russia's economy is owned by 36 men. From Our Own Correspondent was broadcast on Saturday, 21 April, 2007 at 1130 GMT on BBC Radio 4. Please check the programme schedules for World Service transmission times.